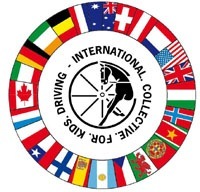 The International Collective for Kids Driving (ICKD) is a group of enthusiastic representatives from several different nations who are passionate about promoting the sport of Carriage Driving for children. ICKD rules closely follow those of the FEI but with modifications to make it safe, simple and fun for children as young as 7 years of age to take part in competition. The ICKD aims to present an straight forward route into the sport, making it an appealing form of event for Organising Committees, Parents, Trainer’s and of course the children themselves. In summary the ICKD format is a three phase, arena based, competition. It can be run as a one, two or three day event. There is no minimum size for ponies, only one carriage is required of a minimum width of 100 cm. In place of the marathon is a Derby which is a combined cones course with up to three marathon obstacles. It is similar to an FEI World Cup Driving course but the cones are of standard width and canter is not permitted through the cones.